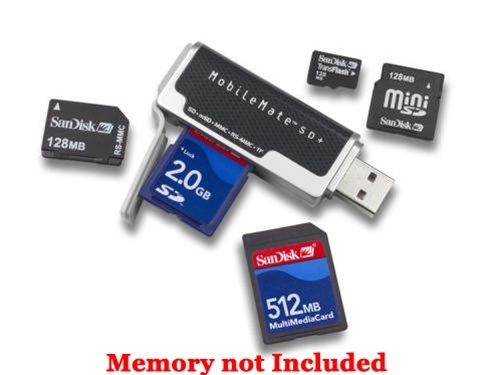 SanDisk’s USB MobileMate line of Mobile Readers are the smallest readers on the market and unique in its compatibility class (SD/miniSD/MultiMediaCard/RS-MMC/TransFlash Memory Stick/Memory Stick Duo/Memory Stick PRO/ Memory Stick PRO Duo), ideal for memory-enabled mobile phone, voice recorders users and photo travel needs. The flash memory cards can be plugged directly into the readers. No card adapters are required. Carry it with you so you always have access to your important data.